C.D. 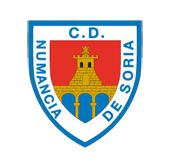 Numancia overcame C.D. Lugo by a clear 3-0 score line at Los Pajaritos in the Sorianos’ first fixture in February. The three points thus earned take the Rojillos to a total of 30, and also means they take head-to-head advantage over the Galician side, who had won the corresponding fixture 3-2 at the Anxo Carro in the first round. It was, without any doubt, a soothing win for the Numantinos, who are having a good run, both in terms of play and results, with only one defeat (against Oviedo), in their last seven fixtures. The four reinforcements brought in during the winter window all got to play against Lugo. Derik, Ganea and David all started, while Gus Ledes came on in the 65th minute for an exhausted Diamanka, who is running himself into the ground in every game after spending the week wrapped in cotton wool. 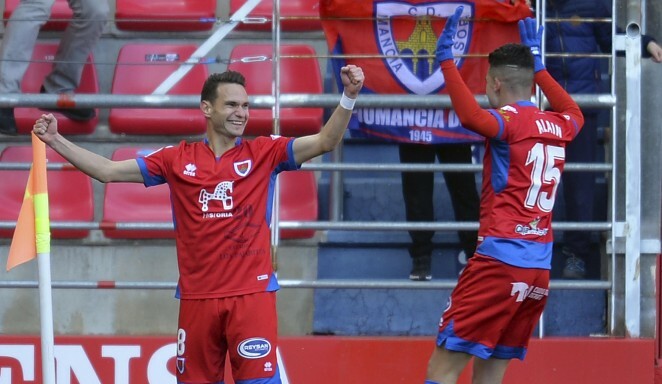 All of them had a part in a win in which Numancia also kept a clean sheet, but the big prize was carried off by David Rodríguez, who was making his debut in the red shirt and, as he often does, found the net. Los Pajaritos has always been a happy hunting ground for him, but this time he scored in a Numancia shirt, rather than someone else’s. Only 12 minutes had gone by when he was fed in nicely over the top of the Lugo defence by Fran Villalba, allowed the ball to bounce in front of him and then struck it with his left foot past the advancing Juan Carlos to open the scoring. López Garai’s side thus went ahead in a game that neither side was able to dominate too much, and which was fairly evenly balanced in terms of possession over the first 45. There were, in fact, spells when the visitors pegged the hosts back, but the Rojillos defended their lead well, until the referee pointed the way to the dressing rooms. The second half began with a change in formation on the part of the visitors. Lugo had begun with three across the back and two playing wide but came out after the break with a back four and a midfield trio, with the aim of seeing more of the ball and creating more play. It is true that Lugo are a side who like to play the ball around rather than going for Route 1 tactics, and they showed it at Los Pajaritos. Numancia, for their part, were having none of it and allowed their opponents little space to operate in, as well as taking advantage well of those that Lugo left them, above all with balls over the top of the defence. That was how the first goal had come, and the second came that way too. Nacho ran into the space to intercept a poorly-placed pass to Malagón across the centre of the pitch and raced into the box where he slotted calmly past Juan Carlos at the near post. The game had not quite reached the hour mark, but although there were still over 30 minutes to play, Numancia were not in the mood to give the visitors any chance of getting back into it. This was so much so that Juan Carlos, in the hosts’ goal, barely had to stretch himself to make any saves throughout the contest, and only intervened as a result of corners and free kicks. Right at the end, Escassi was shown a direct red card after clattering Gerard V. to put a stop to a Lugo counter-attack, which means he will miss the away clash with Almería next week. With ten men on the pitch, though, the Rojillos were still able to add a third just a minute later when Guillermo headed in Alain Oyarzun’s cross to put the finishing touch on a good overall performance by the whole side. C.D. Numancia: Juan Carlos, Escassi, Ganea, David (Guillermo, m. 80), Yeboah (Nacho, m. 57), Derik, Alain, Medina, Atienza, F. Villalba, Diamanka (Gus Ledes, m. 65). C.D. Lugo: Juan Carlos, J. Malagón, C. Pita, Seoane, T. Martínez (M. Barreiro, m. 67), Lazo, Juan Muñiz (Gerard V., m. 46), Sergio Gil (Escriche, m. 61), Campadabal, Vieira, Iriome. Referee: Domínguez Cervantes (Andalusian Committee). Assisted by Ortiz Calderón and López López. Yellow cards for Gerard V., Malagón, Sergio Gil and Vieira (Lugo) and Alain Oyarzun (Numancia). Direct red for Escassi (m. 90). Goals: 1-0. Minute 12. David. 2-0. Minute 59. Nacho. 3-0. Minute 90. Guillermo.